The Gentle Barn is a national nonprofit organization, founded in 1999 as a safe haven and place of recovery for severely abused animals. The Gentle Barn offers their unique philosophy of rehabilitating animals and connecting their stories of survival and healing to the personal experiences of inner city, at-risk and special needs children who have suffered physical, mental or emotional trauma. By interacting with The Gentle Barn's approximate one hundred and fifty animals and taking a hands-on role in their welfare, those who participate in the programs at The Gentle Barn learn empathy, trust and forgiveness. 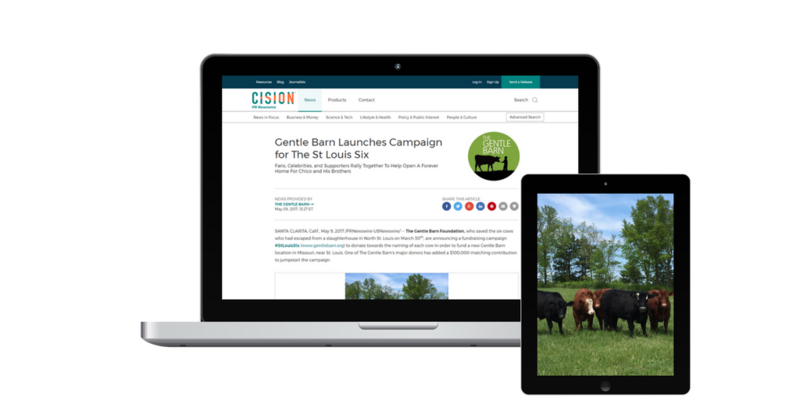 To help meet its goal, The Gentle Barn chose to use Cision Distribution by PR Newswire’s national and California-wide networks. Weiner and his team had not been with a PR firm for more than a year, and often used press releases, but most frequently on a local scale and widespread distribution was typically limited to the reaches of their social media networks. “Cision afforded us the ability to share our story with a greater population, which is something we had wanted to do,” said Weiner. 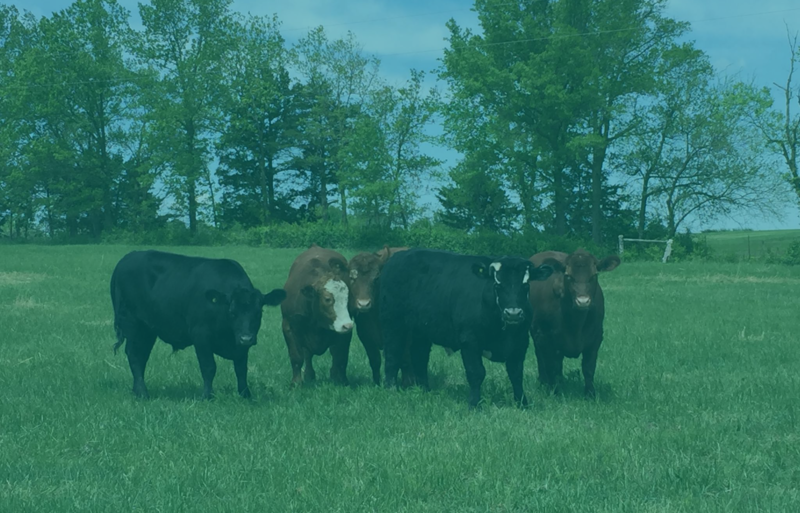 The Gentle Barn's Visibility Report showed more than 1,700 press release views and over 1,300 views on its multimedia assets, leading to valuable earned media attention. “An NBC affiliate in St. Louis saw our release and had us in-studio for an interview, right away,” said Weiner. An outlet in Knoxville, Tennessee, home to an existing Gentle Barn location, ran a story based on the St. Louis expansion plan. “Working with our contacts in Knoxville was incredibly rewarding, and reinforced our operation in that area, and furthered the social media buzz,” said Weiner. The Gentle Barn valued the guidance from the Cision and PR Newswire team. 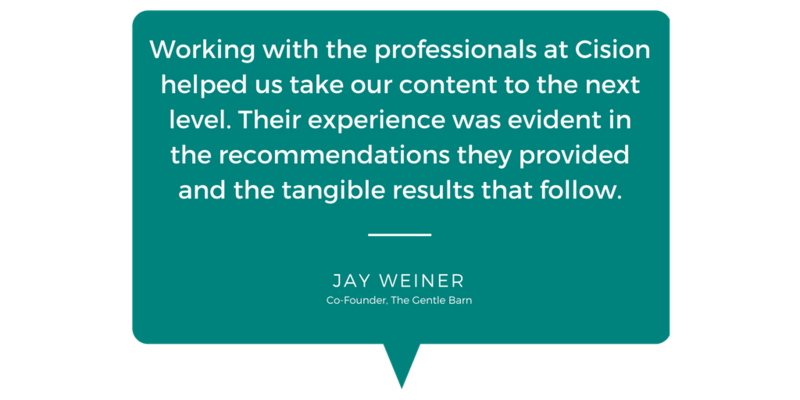 “Working with the professionals at Cision helped us take our in-house content to the next level,” said Weiner. “Their experience is evident in the recommendations they provide and the tangible results that follow.” Adding Spanish distribution helped the foundation develop a subsequent press release with celebrity Daisy Fuentes, who has worked with The Gentle Barn in the past and provided supporting quotes for their promotional content. “Daisy gave a video tour of The Gentle Barn to Univision and soon Telemundo, which was all born out of this strategy,” said Weiner.